Kershaw Mini Cyclone Knife, Black Aluminum Handle, PlainEdge. The Kershaw Mini Cyclone Knife features a 3 3/16" drop point blade made of Sandvik 13C26 stainless steel. The blade has dual thumb studs, Index Open System and SpeedSafe On/Off assist for ambidextrous one hand opening. The SpeedSafe On/Off allows the user the choice of SpeedSafe Assist or fully manual operation. The black anodized 6061-T6 aluminum handle, 4 1/4" closed, has a liner lock and a lanyard hole. An end to end reversible metal pocket clip is included. 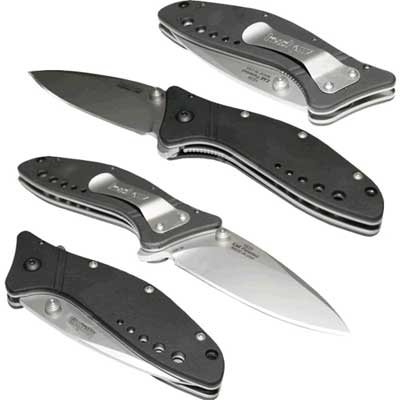 The Kershaw Mini Cyclone Knife has an overall length of 7 7/16" when open and weighs 5.3 ounces.